Today, there is every reason why you should own a blog. You are missing out on spice of life in the 21st century if you are not blogging. There are DIY techniques and free templates for fast and easy setup of a blog. However, the ease of owning one does not necessarily translate to its effectiveness. There are billions of blogs meaning you have to be specific and strategic to be visible. It won’t make much sense if your blog is not visible. We won’t call it flooded because there are endless opportunities and amazing milestones that you can achieve with a blog. Blogging is only interesting if you have quality traffic and you are making money or achieving a specific objective. It all begins with the design. Whether you engage a professional or use the DIY techniques, choice of themes is crucial. You should define a target audience and choose suitable themes that match their interests. An attractive theme is the first technique to get your blog noticed. A theme is the first impression on your blog. A theme also helps in highlighting aspects for your site visitors. It creates an atmosphere for your audience even before they go to specific content. Rosemary is about clarity and simplicity. While it depends on your niche, site visitors are rarely attracted to complicated blogs. Also, with the increasing number of blogs, you should make it easy for site visitors to find what they need. Rosemary theme makes it fast and easy to navigate your site and get to specific content. The theme has multiple layout choices based on your blog objectives. If it is for entertainment, information, or formal purposes, the layouts are designed to achieve different goals. If your strategy is using a photograph on the home page, a wide layout will be the best to enhance the image quality. If you have several photos and wish to slideshow them to your visitors, you can organise them to a gallery. You can customise the blog layout to match your specific interests. Rosemary theme maintains elegance and tidiness of your blog. The theme is integrated with incredible fonts that allow you to customise your content without any restrictions. The fonts also adjust to the size of your preferred blog page. Besides, fonts on this them are used to emphasise specific content for your target audience. The theme is designed for professional writers. It entails incredible layouts and contrast that enhance content goals and attract the reader’s attention. The theme guarantees you a flow of photos and write-ups to match your niche and audience preferences. Readers can also sample on your articles without moving from the page. 2019 is characterised by class; this is the best way to add a touch of class to your blog. The theme offers you multiple options for presenting your image. Photo integration can be based on the natural layout or customised to blend in with the theme of the photographer. The distinguishing feature of this theme is a photo slider. The theme has at least 40 built-in options to present photos. You can either choose a large central photo layout, cascades, triple split, among other incredible photo layout options. All the layout options are organised in different categories within a slider directory. Soledad allows you to fit all the highlights on the front page. You can structure the front page into multiple columns and highlight elements based on your blog objectives. A single column design is also available to draw a reader’s attention. The font gives you the flexibility to customise your blog based on your blog objectives. Am not sure why this theme is associated with females. Of course, it has a soft and elegant effect, but that doesn’t mean it is for specific niches. With advancement in technology comes flexibility and freedom, not restrictions. This is one of the top blog themes in 2019 because of its focus on articles and individual posts. The theme allows your site visitors to quickly identify what they need from the front page with fewer distractions. The theme helps you establish confidence and loyalty with site visitors because of specific products and services without distractions. The interesting aspect about this theme is you still achieve to sell or advertise unrelated products because site visitors will bump into other posts as they find their way to a specific product. 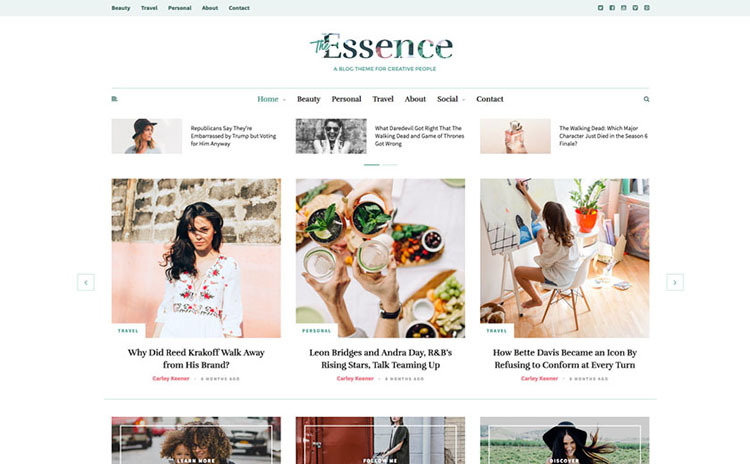 Essence is unique because of the bylines and strong headlines. You will receive constant updates on each of your posts. The goal is to make it easy for site visitors to access content. The theme focuses on specific text that relates to the blog objectives. The core objective and highlights of the blog are centralised, and the titles are enhanced. There are no flashy pictures on this theme to distract the reader. The theme only allows a photo if you believe it has a thousand words; otherwise, it is beautiful and relevant without photos.